1. Check whether the given matrix 'A' is a singular or non-singular matrix. That is |A| ¹ 0. 2. If A is singular, A-1 does not exit. If A is non-singular proceed to find the inverse of the gives matrix. 3. Interchanging the elements of the principal diagonal of A. 4. Change the sign of the other two elements in A. 5. 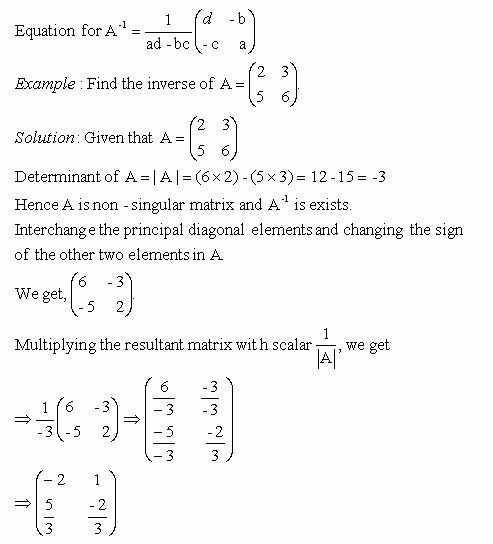 Multiply the resultant matrix with the scalar 1/(ad-bc). Directions: Find the inverse of the given matrix. Also write at least ten examples of your own.